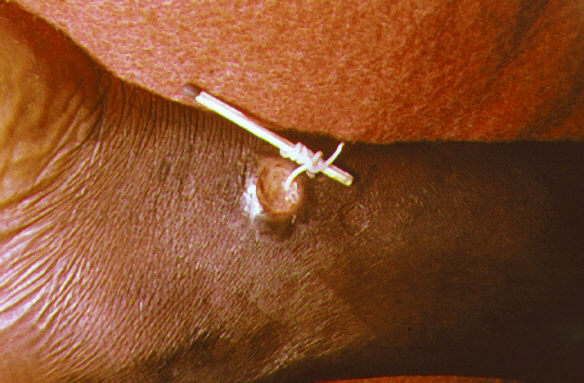 A common method of extracting the Guinea Worm from the skin. Photo source: Wikimedia Commons. If you woke up this morning feeling like life was getting you down, that it was too cold, or too hot, annoyed that the internet wasn’t working, or upset because your flat mate drunk the last of your milk, reading this article may just make you feel a bit better about your situation. Guinea Worm Disease (aka Dracunculiasis) occurs in individuals who have become home to the roundworm Dracunculus medinensis. It is contracted by drinking stagnant water which contains water fleas (copepods) infected by Guinea Worm larvae. The Guinea Worm larvae mate inside the human host. Females may grow up to 1 metre long during the time they spend maturing inside the body, and be ‘as thick as a spaghetti noodle’. After mating, the male dies, and, after a year of incubation, the female emerges through blisters in the skin. This is an incredibly painful process, and often the sufferer will immerse their limbs in drinking water, stimulating the emerging worm to release eggs into the waterway, continuing the cycle. Symptoms of Guinea worm disease include fever, chills nausea and a lack of energy, before the formation of the blister which the worm emerges from. It takes at least ten days for the worm to fully exit the wound, and commonly the worm is wrapped around a stick, and pulled a little every day. There are no vaccinations or treatments for Guinea Worm Disease. For a photo essay on the fight against Guinea Worm disease by Time Magazine, click here. As humans are the only host for the disease, it is hoped that this will be the first disease eradicated without the use of vaccines or medical treatment. If those who contract the disease can be prevented from infecting waterways, then the cycle can be stopped. From the other end, filtration of drinking water inhibits the ingestion of the water fleas which are host to the Guinea Worm larvae. The Carter Centre, a charity founded in 1982 by former US President Jimmy Carter and his wife, Rosalynn Carter, has been instrumental in the fight to eradicate Guinea Worm Disease. Together with the U.S Centre for Disease Control and Prevention, UNICEF and the World Health Organization (WHO), the Carter Centre launched a global eradication campaign in 1988. The campaign aimed to educate villagers, and provided access to safe drinking water. So far, the Carter Centre has had outstanding success. In 1986, there were an estimated 3.5 million cases across 21 different countries, while in 2011, there were only 1060 cases reported, with 97% of these occurring in South Sudan. For more on the Carter Centre’s work, watch the video below. All in all, this makes me feel very lucky to live in a house where fresh, clean, and safe drinking water flows from a tap. I greatly admire those who have turned Guinea Worm Disease eradication into their personal fight, and hope that you all can take some inspiration from this story. The way of the future? Climate Change increasing waterborne diseases in the Arctic? This blog was made as a part of the Masters Degree in Creative Non-Fiction Writing at the Centre for Science Communication at the University of Otago in New Zealand.